HONG KONG, 26 February 2015 – The Board of Directors of AIA Group Limited (stock code: 1299) is pleased to announce that AIA has achieved another excellent set of results for the year ended 30 November 2014. The Board of Directors has recommended a final dividend increase of 19 per cent to 34.00 Hong Kong cents per share, subject to shareholders’ approval. This brings the total dividend for 2014 to 50.00 Hong Kong cents per share. “AIA achieved another excellent set of results in 2014, delivering a record VONB of US$1,845 million, up 24 per cent from 2013. Our performance is a clear reflection of the strength of AIA’s business model, the determined execution of our proven growth strategy and our position as the leading insurer exclusively focused on the Asia-Pacific region. The consistency in our performance year on year, with each of our key financial metrics ¬reaching new highs, demonstrates AIA’s potential for future value creation. “Asia is one of the world’s most attractive and dynamic insurance markets. Urbanisation, rising disposable incomes, relatively low levels of social welfare and a rapidly-growing middle class continue to provide enormous structural growth opportunities across our markets. AIA is exceptionally well-positioned with our market-leading positions, extensive geographical reach, deep experience in Asia and exceptional financial strength. We are committed to growing our business by helping our customers meet their long-term protection needs and wealth aspirations. We will continue to do this in a way that reflects our aim of making a difference to the real lives of people and their communities. (1)	Change is shown on a year-on-year basis unless otherwise stated. (2)	VONB is calculated based on assumptions applicable at the point of sale and before deducting the amount attributable to non-controlling interests. The amounts of VONB attributable to non-controlling interests in 2014 and 2013 were US$13 million and US$11 million respectively. (3)	VONB includes pension business. 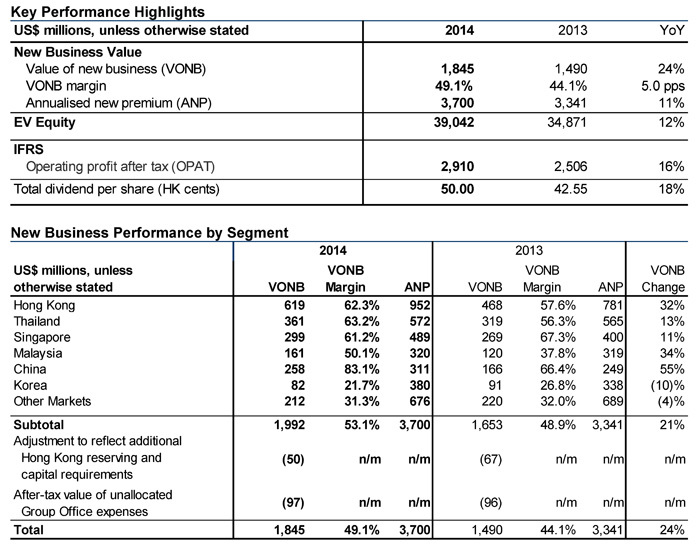 ANP and VONB margin exclude pension business. (4)	ANP represents 100 per cent of annualised first year premiums and 10 per cent of single premiums, before reinsurance ceded and excluding pension business. (5)	IFRS operating profit after tax (OPAT), net profit and operating earnings per share are shown after non-controlling interests unless otherwise stated. (6)	EV Equity includes goodwill and other intangible assets. (7)	Hong Kong refers to operations in Hong Kong and Macau; Singapore refers to operations in Singapore and Brunei; and Other Markets refers to operations in Australia, Indonesia, New Zealand, the Philippines, Sri Lanka, Taiwan and Vietnam. (8)	AIA’s previously-announced acquisitions of ING Management Holdings (Malaysia) Sdn. Bhd. (ING Malaysia) and Aviva NDB Insurance (ANI) in Sri Lanka completed in December 2012. The financial results of these two newly-acquired businesses are accounted for in the Group’s 2013 results from the respective dates of completion. (9)	The results of our joint venture in India are accounted for using the equity method. For clarity, ANP and VONB exclude any contribution from India. (10)	2013 financial information as well as EV and EV Equity have been adjusted to reflect the adoption of new and revised accounting standards by AIA in 2014. The Group’s financial information in this document is based on the audited consolidated financial statements and supplementary embedded value information for the year. This document is for information purposes only and does not constitute an invitation or offer by any person to acquire, purchase or subscribe for securities. This document is not, and is not intended to be, an offer of securities of the Company for sale in the United States. The securities of the Company have not been, and will not be, registered under the U.S. Securities Act of 1933, as amended (the “U.S. Securities Act”) and may not be offered or sold in the United States absent registration or an applicable exemption from registration requirements under the U.S. Securities Act. There is not, and is not intended to be, any public offering of the securities of the Company in the United States.